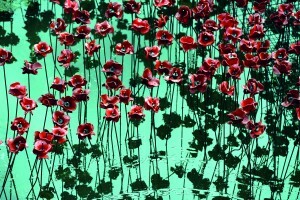 14-18 NOW, the UK’s official arts programme for the First World War centenary, today announced details of its 2016 season which centres on the anniversary of the Battle of the Somme. Artists from around the world have been invited to create new works in response to the First World War and its impact on the world we live in today. The programme takes place across the UK between 22 March and 18 November 2016 and features many free events. The themes of the 2016 season include the changing role of women, the treatment of conscientious objectors and the contribution of South Asian soldiers. The first season took place in 2014 and was experienced by 19 million people. The 2016 programme takes place across the UK, with events in Margate, Manchester, Leith, Oxford, Perth, Norwich, Brighton, Sunderland, Cardiff, Aldeburgh, Kendal, Birmingham, Stockton-on-Tees, Bradford, Leeds, Belfast, Derry-Londonderry, Fife, Windermere, Orkney, Lincoln, Perth, Caernarfon and London. A key theme of the 2016 season is the changing role of women during the First World War. Fashion & Freedom at Manchester Art Gallery (13 May – 27 November 2016) sees some of today’s leading female fashion designers, including Vivienne Westwood and Roksanda, explore the impact this important shift had on fashion at the time. End of Empire (22 March – 30 October) is a new work by Yinka Shonibare, MBE co-commissioned with Turner Contemporary to mark the fifth anniversary of the art gallery. The work features two figures in Shonibare’s signature African fabrics, and explores the impact of alliances forged in the First World War. The work is presented alongside Shonibare’s The British Library, which looks at immigration in Britain. Artist Ciara Phillips will “dazzle” the MV Fingal (from 28 May), berthed in the historic port of Leith, to mark the centenary of the Battle of Jutland. Phillips will put her own unique spin on the astonishing camouflage patterns that adorned battleready ships in the Port of Leith one hundred years ago. The ship will be a central element of the Edinburgh Art Festival for 2016. Dazzle Ship Scotland is supported by the Scottish Government and the Dazzle It app is supported by Bloomberg Philanthropies. Rebecca Warren presents a major new outdoor sculpture as part of The Body Extended: Sculpture and Prosthetics (21 July – 23 October) at the Henry Moore Institute. The exhibition looks at the impact the First World War had on how we think about the human body, and how this demanded new ways of thinking about prosthetics, disability and beauty. Pakistani artist Imran Qureshi, one of the most important contemporary artists from the subcontinent, has been inspired by the experience of British Indian regiments that fought alongside the Allies. New commission A Garden within a Garden will see Qureshi transform the Mughal Garden in Bradford’s awardwinning Lister Park (June – September). The historic house and grounds of Brockhole, Windermere, in the heart of the Lake District, will be taken over by artist Geraldine Pilgrim in Flight (8 – 17 July), a cocommission with the Lake District National Park as part of Lakes Alive Festival. Pilgrim invites audiences on a performance journey and installation trail inspired by the missing airmen of the First World War. Radio Relay explores historic moments in the development of radio, from the first pirate broadcast during the Easter Rising to the trench radios that were first used at the Battle of the Somme. Artists including Graham Fagen, Paddy Bloomer and Mhairi Sutherland will create new works for a nationwide programme with participation at its core (April – June). Shelter sees artist Anne Tallentire explore the Nissen Hut, a structure invented in the First World War, in the context of the current refugee crisis. The work is a cocommission with Nerve Centre, and will see Tallentire work across a range of media, including drawing and film. Audiences are invited to watch her work at an open studio at a former barracks in Derry-Londonderry (June – July). 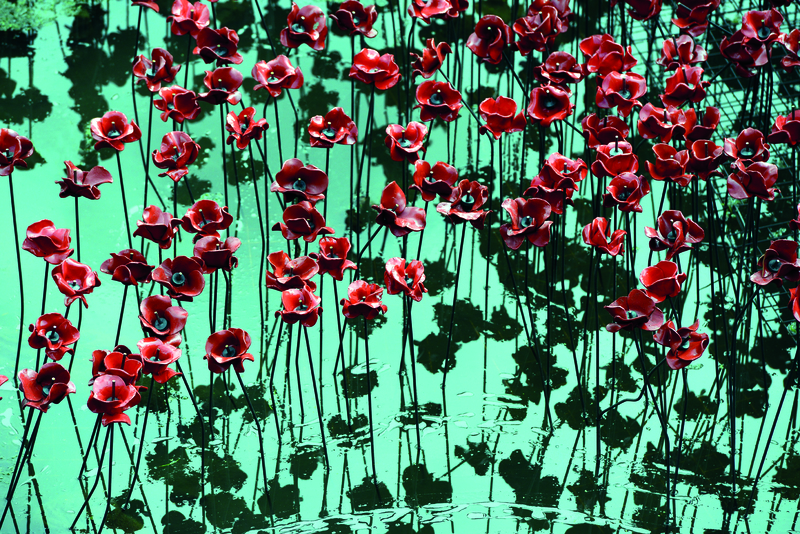 The iconic poppy sculpture Weeping Window from the installation Blood Swept Lands and Seas of Red – poppies and original concept by artist Paul Cummins and installation designed by Tom Piper – will go on display at St Magnus Cathedral in Orkney (22 April – 12 June) to commemorate one hundred years since the Battle of Jutland. This visit is part of the expanded UK-wide tour of Wave and Weeping Window funded by the DCMS and Lady Susie Sainsbury’s Backstage Trust. In 2016 the sculptures will also be presented in Lincoln Castle, Caernarfon Castle and the Black Watch Museum, Perth. Offering a uniquely female perspective on war, science and the advance of chemical weapons, The Forbidden Zone (26 – 29 May) is a multimedia show directed by Katie Mitchell. Performed at the Barbican, the play focuses on chemist Clara Immerwahr, and uses feminist texts by Virginia Woolf and Mary Borden. The work is performed in English and German with English subtitles, and features the ensemble of Berlin’s Schaubühne Theatre. 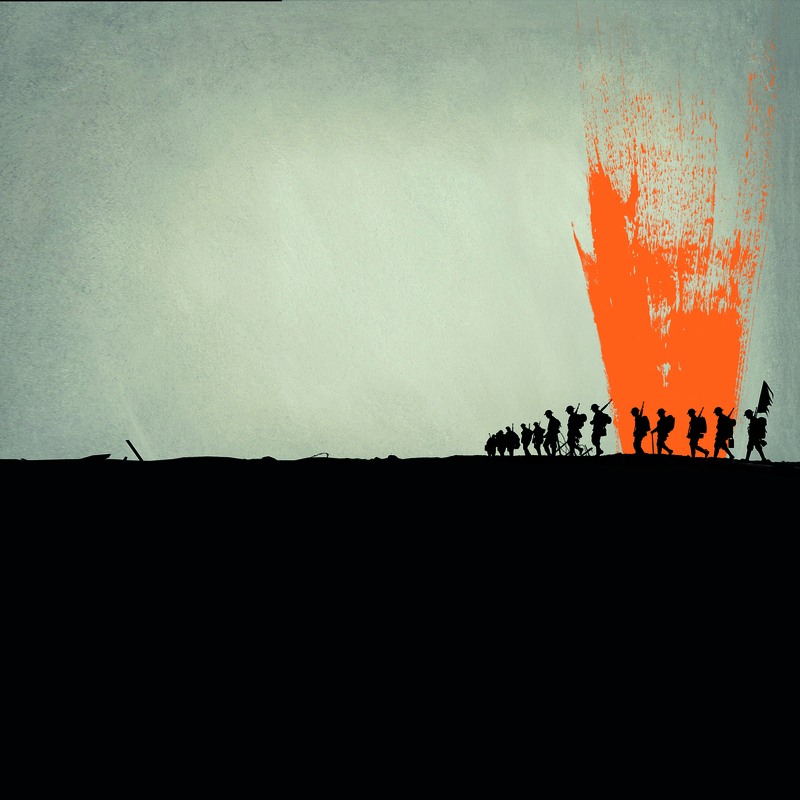 The National Theatre of Scotland presents the world premiere of The 306: Dawn (24 May – 11 June), a co-production with 14-18 NOW and Perth Theatre, in association with Red Note Ensemble, which charts the heart-breaking story of three of the 306 British soldiers who were executed for cowardice and desertion during the First World War. Furious Folly by Mark Anderson (from 17 June) is a nighttime open-air performance that draws on the aesthetics and anti-war sentiment of the Dadaist movement. Audiences are immersed within an open-air collage of sound, light, pyrotechnics and performance. Dr Blighty (24 – 29 May) looks at the untold story of the hundreds of thousands of men that travelled from India to fight for the Allies in the First World War, and the experiences of the injured soldiers who came to be treated in Brighton. 100 years ago, Brighton’s Royal Pavilion Estate was used as a hospital for wounded Indian soldiers and will be reimagined in an outdoor installation in the Royal Pavilion Garden. Created by Nutkhut for the 50th Brighton Festival, this free, immersive work will use video and audio installations as well as documents and images from the time to bring the stories of the Indian soldiers to life. Africa Express presents… the Syrian National Orchestra for Arabic Music with Damon Albarn and guests at Southbank Centre (25 June), in a cocommission with the Holland Festival. The Syrian National Orchestra for Arabic Music first performed with Damon Albarn in Damascus in 2008 before appearing on a Gorillaz record and later joining the group on a world tour which included shows in Syria and Lebanon. The 1916 Sykes-Picot Agreement fostered instabilities in the Middle East that continue to cause conflict today. This special concert will reunite the musicians from the Syrian National Orchestra for Arabic Music to highlight and celebrate their remarkable music and culture. Obie Award-winning New York performer Taylor Mac brings a series of flamboyant concerts to Belfast International Arts Festival in what will be his first performance in Northern Ireland. As part of his 24 Decade History of Popular Music, The WW1 Years And More (October 2016) is an extraordinary take on world history through popular music and culture from 1896 to the present day. To mark the centenary of the Battle of the Somme, Welsh National Opera present the world premiere of In Parenthesis by composer Iain Bell (from 13 May). Directed by David Pountney, the opera is based on the epic poem by David Jones and marks the 70th birthday of the company. In Parenthesis is commissioned by Nicholas John Trust and 14-18 NOW. American composer David Lang presents Memorial Ground as part of the East Neuk Festival, with support from Creative Scotland. The large-scale choral work will engage community choirs across the UK throughout the period of the Battle of the Somme centenary (1 July – 19 November), culminating in a UK-wide event. A series of concerts at the Aldeburgh Festival will feature works written during the war years, including works by Berg and Debussy, alongside world premieres from Gary Carpenter, Charlotte Bray and Vassos Nicolaou (17 & 24 June). The series includes a performance by the BBC Symphony Orchestra conducted by Oliver Knussen. As part of Dr Blighty, the Philharmonia Orchestra give a performance at Brighton Dome featuring leading Indian musicians. Incredible Journeys sees 14-18 NOW and The Story Museum in Oxford commission six new stories for schoolchildren and their families about the global impact of the First World War. The stories range from humble tales of everyday life to near-legendary accounts of battlefield heroism, using animal characters both real and imagined to create their brand new narratives. Fierce Light at Norfolk & Norwich Festival (May 2016) invites some of today’s leading poets including Yrsa Daley-Ward, Jackie Kay, Bill Manhire, Paul Muldoon and Daljit Nagra to respond to the horrors of the battlefield, with selected filmmakers creating visual responses to the poems. As part of Fierce Light – a cocommission with Writers’ Centre Norwich – Simon Armitage presents Still, a series of poems written in response to aerial photographs of the Somme, with the words superimposed on the haunting images. Several of the poets will read at Norwich Playhouse on 13 May, followed by an exhibition of the specially commissioned films and photographic artworks running until 29 May. Black Dog – The Dreams of Paul Nash is a new graphic novel by illustrator, comic artist, filmmaker and musician Dave McKean. The novel will be released in two editions – a limited edition in May and a full publication in October at the Lakes International Comic Art Festival. It will be accompanied by a multimedia performance by McKean and fellow musicians. McKean explores the work of Paul Nash, one of the most important British artists of the twentieth century, whose First World War experiences inspired him to create paintings of disturbing, lasting power. Asunder is an ambitious new event exploring the legacy of one of the most traumatic battles in military history, the Battle of the Somme, through the prism of a single city: Sunderland. Esther Johnson’s film will tell a powerful story of the city’s involvement through hitherto untold personal experiences. Two renowned bands from the North East, Field Music and Warm Digits, will create the film’s soundtrack, which will be performed live with Royal Northern Sinfonia. Guided by writer and musician Bob Stanley, Asunder will premiere at a major event in Sunderland Empire on 10 July. BalletBoyz have adapted the immensely successful show Young Men, cocommissioned by Sadler’s Wells and 14-18 NOW with music by Keaton Henson, from the stage to the big screen in their feature film debut. The film is shot on location in France, and is a silent period drama that tells the story of young men who fight in and are consumed by war. Choreographer Fearghus Ó Conchúir presents The Casement Project (from 3 June) inspired by the British peer, Irish nationalist and international humanitarian Roger Casement, who was hanged in 1916 for treason and whose homosexuality created further scandal. This ambitious commission includes stage performances, an academic symposium, a film, a summer beach dance festival and more. 14-18 NOW are delighted to be partners in Somme 100, the national commemoration of the centenary of the outbreak of the Battle of the Somme, taking place in Manchester on 1 July. The event will include a procession through Manchester to Heaton Park and will end with live outdoor performances of music, dance, and spoken word, featuring the Hallé Orchestra. Heaton Park looks toward Accrington, home of the Accrington Pals who suffered huge losses on the opening day of the Battle of the Somme. The free event will engage young people with the centenary of the Battle of the Somme, and provoke empathy with the many young lives that were lost. The 2016 programme will feature a series of talks and debates. 14-18 NOW is funded by the National Lottery through the Heritage Lottery Fund and Arts Council England, and by the Department for Culture, Media and Sport. 14-18 NOW is an independent programme hosted within Imperial War Museums. 14-18 NOW would like to acknowledge their partnership with the BBC on projects in the 2016 season.